15 of the most beautiful government buildings in the U.S.! While the Capitol in Washington, DC is the most recognizable in America, each state has its own capitol building where the business of democracy takes place on a more local level. Each building reflects the unique history, culture of the state in which it's located and serve as something of a shrine to the process of government. Collectively, they add much color to the tapestry of our country. While residents of each state would definitively declare their state house to be the most beautiful outside of our nation's capitol, these fifteen regularly get voted "tops" by locals and visitors alike. Sitting just slightly higher than the rest of the Mile High City, the building was modeled after the Capitol in Washington, DC. But the dome that sits atop it is a bit more "sparkly," being covered in gold leaf. That was done to commemorate the Gold Rush in that state. When it was finished in 1879, no less than the New York Times praised it as "[sparkling] like a fairy palace of frost work." The bronze statue that once sat atop the dome was taken down in 1938 after being damaged in a bad storm; during WWII it was melted down for ammunition. The chambers are shaped like volcanoes. Volcanoes! But they represent the formation of the Aloha State. Add in an open-air courtyard, a reflecting pool and an overall design that takes its cue from local flora and fauna. Yeah, it's pretty darn gorgeous. 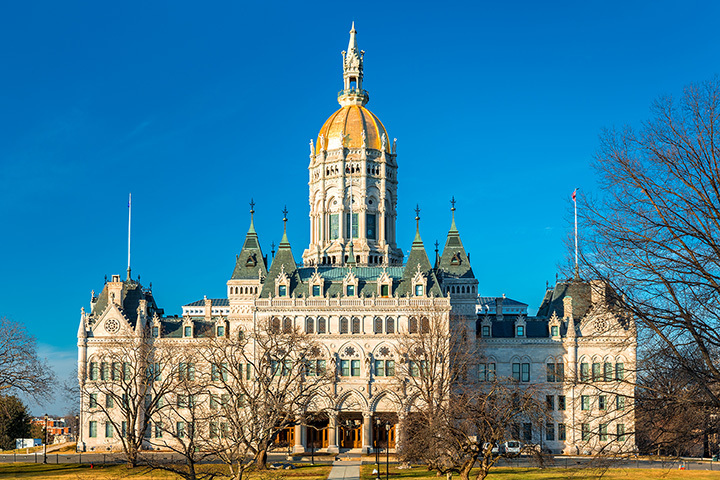 It's the only state house in America with not one, but five, domes, each topped by a golden lantern. The rotunda includes three different woods native to the state - oak, cherry and walnut. The senate chamber boasts intricate French chandeliers, and the grand marble staircase is also something to see. It takes a giant turn away from the usual Gothic-Revival style of most government building into vintage Art Deco. It's also that tallest state capitol building in the country, offering some amazing views from the observation deck. Governor Huey Long conceived the building, which opened in 1932. After his assassination in 1935, he was buried on the grounds. It has a distinctly French look, influenced by the Beaux-Art style. While the inside is pretty gorgeous, you can also get an eyeful from the outside: the copper and gold eagle atop the dome soars over the skyline. At nighttime, the statue "Blind Justice" is bathed in 750 lights making it a spectacular sight. The capitol grounds also house one of the few true replicas of the Liberty Bell. In 1897, the state launched a competition to design the new capitol building. The winning entry combined Montana sandstone and granite in the neoclassical style; the rotunda features four circular paintings, depicting key moments in the state's history. You can also see a glorious 1912 painting of Lewis and Clark that measures 25 feet long and 12 feet high. The outside of the building, completed in 1932, features stone carvings representing key points in the development of democracy. But the inside of this statehouse is even more impressive, with vaulted ceilings, mosaic floors and murals depicting Nebraskan culture. The Memorial Chamber is dedicated to acts of heroism; its built from black marble to represent the evening sky with a beautiful chandelier as the evening star. Before the official opening in 1899, it had taken 25 years to complete this magnificent building, which features grand examples of the Romanesque Revival and Neo-Renaissance styles. The builders had originally envisioned a dome to top things off, but the discovery of stress fractures caused a rethink. Instead, the grand 166-foot staircase at the entrance provides the requisite flourish. Teddy Roosevelt raved about this building when it was dedicated in 1906, calling it "the handsomest building I ever saw." It boasts some pretty incredible stained glass, and the 52-million pound dome was patterned after the one in St. Peter's Basilica painted by Michelangelo. Nashville has often be referred to as "the Athens of the West," so naturally, the designer of this building chose a Grecian temple motif. It's one of only 12 statehouses without a dome. It's also something of an engineering marvel, incorporating both stone and steel. The grounds offer many monuments to Tennessee heroes, including three presidents from the state. James Polk is buried on the grounds. The American Institute of Architects counts this building, dating from 1885, as one of their top favorites. It has more floor space than any other state capitol building (it's Texas, y'all), multiple historic mosaics and statuary and a dome that is higher than the one on the D.C. Capitol. The Virginia General Assembly dates back to 1619 and is the earliest elected body in the West. It continues to meet here, in a building designed by Thomas Jefferson and opened in 1785. The original plaster model is on display. It served as the capitol of the Confederacy during the Civil War. Set on the banks of the Kanahwa River, this glorious structure features nine different types of marble, black-walnut desks (dating from 1932) and a two-ton chandelier. The dome is larger than the one that sits atop the Capitol in D.C. This elegant building was completed in 1917. The dome above the rotunda is the only one in the U.S. made from granite - and it's one of the largest domes in the world. The three-ton statue set atop the dome was sculpted by Daniel Chester French, the man behind the Lincoln Memorial.